Good morning and welcome to another episode of #ThatBusinessShow! It was a great morning here on the show, as we had three wonderful guests, each from different fields! That’s what the show is all about, bringing different business owners, entrepreneurs, and professionals together to spread their message on the #MorningAir! Live in studio every weekday at 8am on #1250WHNZ, our Host, Jamie Meloni, invites you to share your business with the Tampa Bay community! So head over to http://www.tampabayradio.com to listen to the show, and then fill out a contact form to let our producers know what it is you do! Feel free to email christian@tampabayradio.com for bookings as well. Coming on the show today bright and early at 8am was Vincent Lanci, Owner of Strive to Lead! 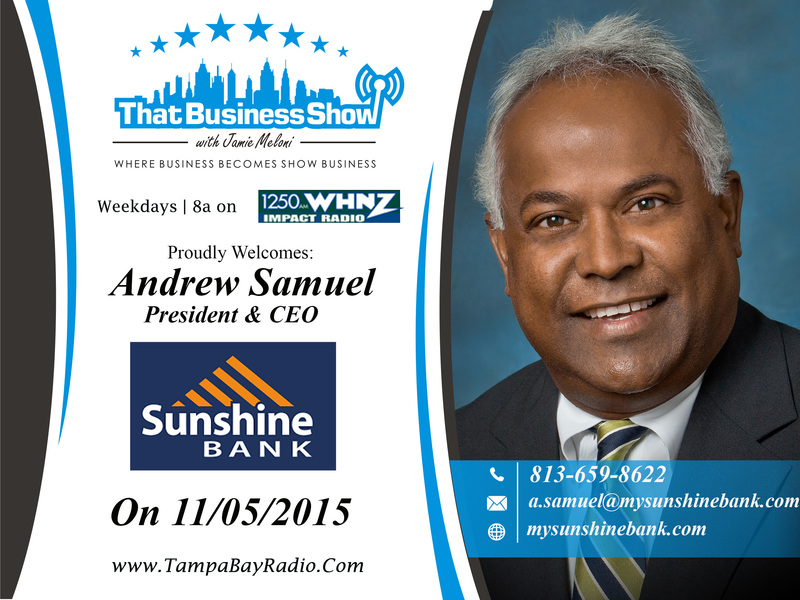 Joining Jamie on the air next was Andrew Samuel, President and CEO of Sunshine Bank here in Florida! 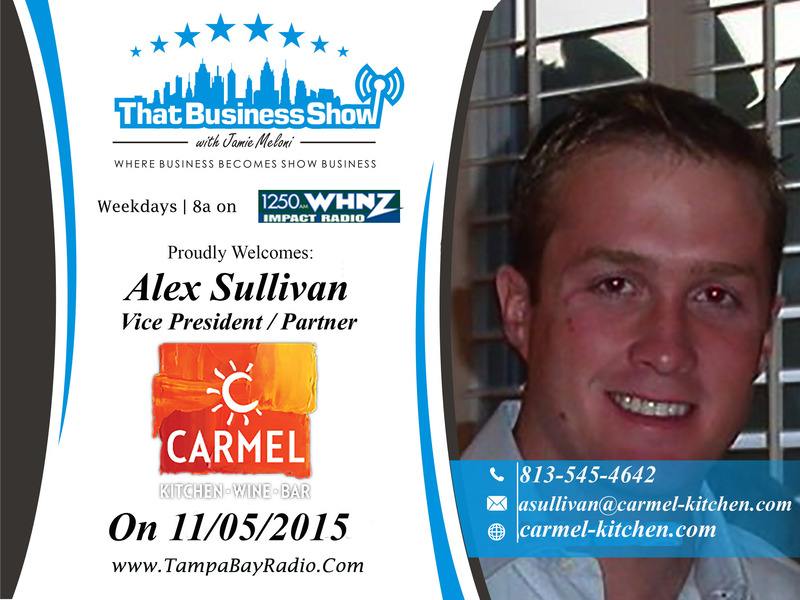 Coming on the air last, but certainly not least, was Alex Sullivan, Vice President and Partner of Carmel Kitchen! Yum! If you missed today’s great show, then head to http://www.tampabayradio.com or also check out Jamie’s YouTube Channel at http://www.youtube.com/jamiemeloni! 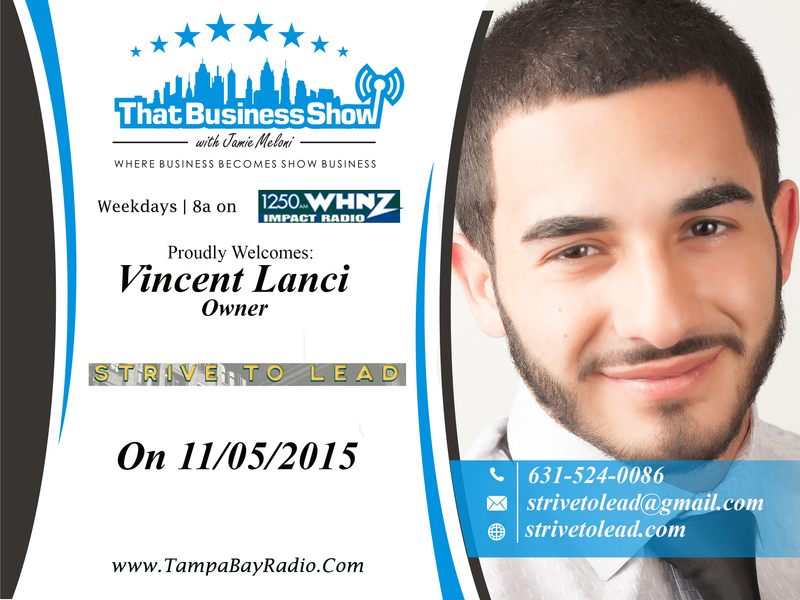 Coming on first to share his story with our listeners was Vincent Lanci, the Owner of Strive to Lead. Vincent began Strive to Lead just months ago, after enduring a tragic accident. In 2013, an intoxicated driver struck him, just days before what should’ve been his last Undergraduate semester. Being left for dead on the street, he was very near death. After awaking from a coma with several injuries like a broken tibia and fibula, and sadly significant brain injuries as well. An estimated full year recovery, sleepless nights, and countless therapy sessions, taught Vincent that he could either sit and sulk, or thrive in his “second life”. Therefore, he founded Strive to Lead, in order to inspire and educate people and business leaders. By using his incredible story to inspire others to have a “never give up” attitude, Vincent #HelpsOurCity! So check out http://www.strivetolead.com or email Vincent at strivetolead@gmail.com! Andrew S. Samuel became President, Chief Executive Officer and Director of the Sunshine Bank in 2014, and now he’s come on the #MorningAir with Jamie Meloni! With extensive financial experience and knowledge, Andrew is quite the expert! Andrew has grown banks and business that would sell for billions! Speaking about his start and his success, and also about the workings of Sunshine Bank – Andrew #HelpsOurCity too! So head to http://www.mysunshinebank.com, and if you missed the show, head to http://www.tampabayradio.com now to listen to Andrew S. Samuel on the #MorningAir! Last on the #MorningAir was Alex Sullivan! Alex Sullivan is the owner of Carmel Kitchen & Wine Bar and is the former owner of Palmcrest Homes of Tampa Bay. With many locations all around Florida, Carmel Kitchen & Wine Bar offers Mediterranean style cuisine, now revamped for the holiday season! Book your next party with Carmel at http://www.carmel-kitchen.com! As they have specials all week, make sure to head to your local Carmel Kitchen & Wine Bar, and tell them you heard about them on the #MorningAir! This entry was posted in Articles, Business, Entrepreneurship and Business, Work and tagged business, business travel, interview, italian food, live, medditerrenean, radio, show business, talk, work. Bookmark the permalink.